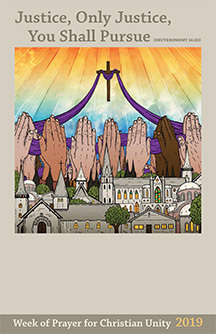 The artwork for this year shows both the concepts of Christian Unity along with the chosen Scripture verse (Deuteronomy:16-20) on the pursuit of justice. Prominently with the work one sees sets of hands clasped together denoting/representing praying Christians, and the figures of children and adults in settings of injustice are shown underneath. Flowing through the praying hands is a long purple sash, which both represents the unity of prayer within the Church and the Saints, but also the fact that the injustices have not gone unnoticed in prayer and love. The hands are reaching out to Heaven, where the Lord’s light beam shine down serving as a representation of the ’Justice that flows from His Heart’. Andrew Kelsall is an independent graphic designer from northern England, UK. He has been working for clients worldwide for around 16 years. He may be contacted at www.andrewkelall.com. As a Christian, his primary focus is Christian-based, designing church logos, CD covers, posters and web graphics. You may see additional works by Andrew at his Christian-based store, www.PassionFury.com.